Americans believe in so many preposterous conspiracy theories—Kennedy was killed by an assassin on the grassy knoll; Stanley Kubrick faked the moon landings; 9/11 was an inside job—that it’s somewhat comforting to discover that other countries also engage in such patent absurdity. 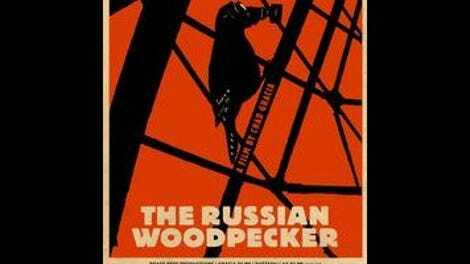 The Russian Woodpecker is ostensibly an investigative documentary, but there’s precious little investigation; its primary subject, Fedor Alexandrovich, is peddling a hypothesis for which he offers no tangible evidence whatsoever. The one novel aspect, given the movie’s title, is that his conspiracy theory takes a genuinely unexpected form. A few decades ago, “The Russian Woodpecker” was how people around the world referred to a recurring shortwave-radio broadcast emanating from Ukraine, which was then part of the U.S.S.R. It sounded a bit like a woodpecker tapping away, and there was speculation early on—the broadcasts were heard from 1976 to 1989—that the Soviets were engaged in nefarious experiments, with some even suggesting the possibility of mind control. In truth, it was an effort at over-the-horizon radar, designed to detect targets well beyond the range of conventional radar (which is limited by the Earth’s curvature). And Alexandrovich, surprisingly, never suggests otherwise. He has an entirely different scenario in mind. Staring into the camera with wild eyes that match the perpetually uncombed mop of hair atop his head, this self-proclaimed artist—who, one friend admits, is perceived by most as either a genius or an idiot—tells the story of his childhood in Kiev, not far from the Chernobyl Nuclear Power Plant. When the Chernobyl disaster occurred in 1986, Alexandrovich, then 4 years old, wound up being evacuated to an orphanage, and he remains obsessed with Chernobyl to this day. (He also remains slightly radioactive.) 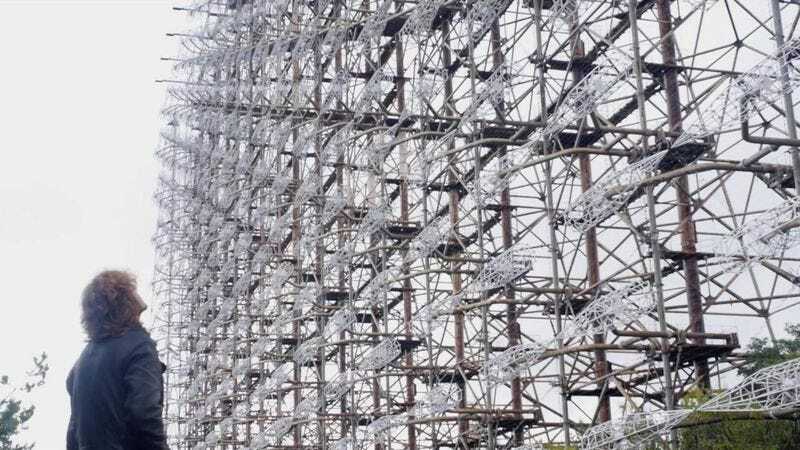 Discovering that the enormous antenna responsible for the Russian Woodpecker broadcasts was located within sight of the Chernobyl plant, he begins to speculate that the two may be connected somehow. Interviews with various experts and former Party officials convince him beyond the shadow of a doubt that a particular Soviet bureaucrat deliberately caused the disaster in order to prevent a forthcoming assessment of the radar project, which was about to be revealed as an enormously expensive failure. In terms of plausibility, this is roughly on a par with “George W. Bush allowed 3,000 Americans to be murdered by Al Qaeda (or, even worse, murdered them himself) so he could justify invading Iraq.” And Alexandrovich never turns up a shred of actual evidence, instead getting unduly excited about what he sees as evasiveness from the people he interviews—in this ridiculous context, pointing at video footage and exclaiming “He’s uncomfortable!” is tantamount to proof positive. Consequently, The Russian Woodpecker is only valuable as entertainment, though the absence of any equivalent to the Zapruder film or allegedly suspicious NASA photos means there’s not much visual interest. (The antenna array, which still exists, and which Alexandrovich climbs, is pretty impressive.) What’s more, there’s a certain irony in the way that the film eventually works in the Euromaidan protests of late 2013 and early 2014, during which cinematographer Artem Ryzhykov was wounded by gunfire. It’s almost as if Alexandrovich and director Chad Gracia use this real-world conflict to distract viewers from the lack of concrete evidence, in the same way that Alexandrovich claims the Chernobyl disaster was meant as a diversion. Hmmm. No, that’s just silly, isn’t it?